If You Plan to Travel with a Passport, You Better Pay Your Back Taxes or Get a Payment Plan. You likely already know that there are serious consequences for not paying your taxes. You can get hit with huge penalties, as well as have to pay hefty interest. If you still don’t pay, your property can be seized and your wages garnished. Changes at the IRS now prohibit people who owe taxes and aren’t making any effort to pay them from going outside the country. In IRS Notice 201801, issued on January 16, 2018, the IRS provides guidance for implementing the new IRC Section 7345. If you owe taxes and you apply for a passport, you will be denied. If you already have a passport and apply to have it renewed, you will be denied. The Fixing America’s Surface Transportation (FAST) Act was signed into law in December 2015, and the IRS is implementing the changes this month. The act affects those who have “seriously delinquent tax debts,” and it requires the IRS to let the State Department know about such delinquencies. The act requires the State Department to deny application for a passport, as well as revocation of a current passport in some instances. Don’t worry: If you just found out that you owe a few hundred dollars to the IRS, your big trip to Paris later this year isn’t likely to be affected. The act only applies to those who are seriously delinquent. That is generally defined as someone who owes the IRS more than $51,000, which can include taxes, penalties, and interest. To be affected by these changes, you must also be subject to a Notice of Federal Tax Lien and have run out the period to challenge the lien. Most people either have a significant tax debt or have gone for a long time without paying in order to meet these qualifications. To avoid any trouble with getting your passport – or having any other problems – the best thing you can do is to enter into a payment plan with the IRS. Of course, you can pay the whole debt, but few people have that kind of cash saved up, especially if they are having problems paying their taxes. You can also protect your passport by filing for bankruptcy protection (though taxes are not always included in bankruptcy settlements), by showing that you have been the victim of identity theft, or by showing that you cannot pay the debt due to hardship. Those who live in an area that has been declared a federal disaster area will be allowed to travel out of it. In addition, those serving in an active combat zone are currently not affected by this change. 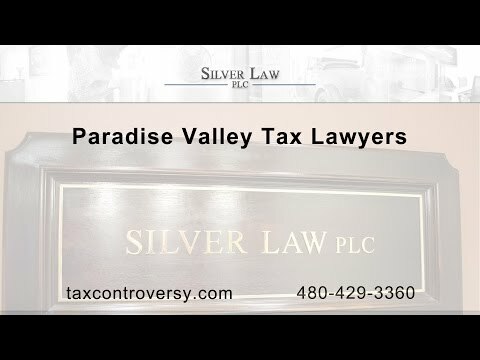 The best thing you can do if you owe back taxes is to work with an experienced Paradise Valley tax lawyer to clear up the matter. Your tax law attorney near Paradise Valley may even be able to minimize or eliminate your debt by examining your past returns and finding mistakes or other deductions that would get you money back some years or lower your tax bill on others. Your tax lawyer can file an adjustment that could reduce or eliminate your current debt. If that’s not possible, your attorney can try to get you an offer in compromise, which allows you to pay less and have your debt cleared. If you are having serious financial difficulties, your attorney may even be able to make an argument of hardship and have your debt dismissed. The most likely outcome is that your tax lawyer can help you set up an appropriate payment plan that allows you to pay back your debt without causing you further hardship. The type of payment plans that the IRS wants typically require you to pay a lot of money in a very short time. Working with a tax law attorney can help you get a more reasonable plan that would not be a burden to pay. If you owe back taxes and are facing the denial of your passport, contact the attorneys at Silver Law PLC in Arizona. Our experienced attorneys have helped thousands of people like you, and they have all worked for the IRS previously, so they have a unique understanding of how to handle these cases and get results for our clients. A Paradise Valley tax law attorney from our team may be able to help you get in offer in compromise or have your debt dismissed for hardship, or your attorney may reduce or minimize your debt through adjustment of previous returns. A tax lawyer from our team can also help you get the right payment plan to take care of your debt quickly. Contact us in Arizona to talk with a tax lawyer and explore which options might be right for you.